The following piece was originally published with Global Times under Chris Russell and is reposted here for archiving purposes. The ChinaJoy Expo, an annual video game exhibition known for legions of animatedly dressed women, is normally a haven for gaming/comic enthusiasts, but it recently welcomed a much different crowd – an order of Buddhist monks. The group’s master said that they came at the invitation of a computer game company. Their presence in the equally novel, equally bawdy event gave rise to a torrent of disdainful comments on the Internet, but the master concedes that this “field trip” was used only as a learning tool to complement their “isolated study,” as reported on chinasmack.com. Images of placid monks parading between exhibition booths full of scantily clad women promoting video games certainly conflicts with the perceived nature of these holy men. Yet as we make our way into the 21st century, orthodox ideas of how monks should behave are clashing with a new era of cyber monks. 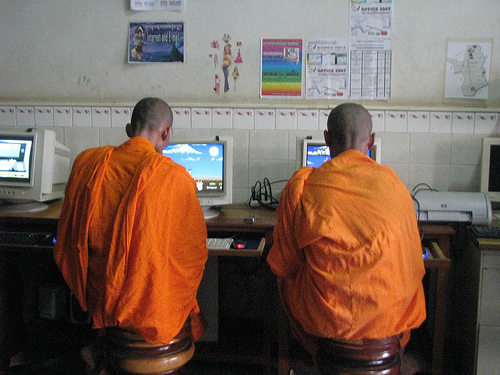 The same men of the cloth who can be seen bowing for alms in the early morning can be found a few hours later just down the street at the local Internet café signing on to their Counter Strike accounts. They nonetheless continue to stay devoted to many traditional conventions. Shunning temptations of meat and the flesh are still the eminent traits, but in order to keep up with society and maintain their traditional role as teachers, the modern world must be meshed with the monistic. Keeping to the old restraints will impede a Buddhist’s work in today’s world. Much like how monks used to spread the word of the sutras on parchments during centuries past, they have now adopted word documents and web logs to communicate. The next avenue, online entertainment, seems to come more out of a natural turn of events than disobedience. It is a truism that being knowledgeable about the world you are preaching to is mandatory to the longevity of what you are preaching. I may be breaking tradition in saying so, but holy men have the right to lead the same lives as others. There are much worse ways to deviate. An interest in the gaming world and the culture it spawns is, after all, much less harmful than an attraction toward little boys – as some clergy members of other orthodox religions get seduced into. Keeping consistent with three modern principles that Buddhists follow with regards to modern technology should keep believers on the correct path toward enlightenment. As long as the mediums lead to benefits (whether social or sociopolitical) and develop an understanding of human beings, monks should still be able to breed inter-happiness without need for atonement. Taking a break from unending rounds of mediation doesn’t hurt either.